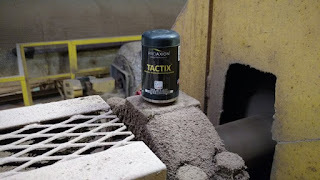 RALEIGH, N.C. -- ProAxion© (www.proaxion.io), developing practical applications for technology by starting with the business need, is pleased to unveil its innovative TACTIX™ 24x7 predictive maintenance system. TACTIX maximizes industrial uptime by drastically reducing the cost and simplifying the process of measuring, transmitting, and analyzing vibration and temperature data for remote monitoring of rotating machines. “At its core, TACTIX helps manufacturers create more products in a shorter amount of time with fewer defects and unplanned machinery stops,” explained Justin Rothwell, CEO and co-founder of ProAxion. ProAxion’s innovative products bring the benefits of data-driven operations and maintenance to the millions of machines that keep our society running and are helping to define the Industrial Internet of Things (IIoT). While that is useful jargon, we are dedicated to developing practical applications for technology by starting with the business need; not the other way around.